After taking assisting my daughters softball team at practice last night, I took my son and daughter to get some ice cream and frozen yogurt. Now wait one minute dont go thinking I was eating ice cream and frozen yougurt, I dont unless my children beg me. You see I am allergic to sugar, It makes me break out in fat. I love that statement. I cannot take credit for it though. I heard it first on the Atkins Boards. Anyway, of course my children wanted to go to different places fortunately for me the stores were right near each other. Anyway, while at the frozen yogurt establishment I saw a friend who I first met about 5 years ago at a soccer (football for my friends outside the US) game. She remembers me looking like my before photos. She said to me, wow you have really made a change, a complete 180 degree turn. She has stated she reads this blog so let me say to her, Thank You Maggie!.. It is an interesting thing that has happened to me, I have truly embraced and thoroughly enjoy eating the way I do and exercising to the extent I do. It has become an obsession. I can think of other things people are obsessed about and can tell you this happens to be a very healthy obsession. I feel great and from what I am told I look fit and healthy. You can get there to. Make exercise your obsession! Do not do this for anyone else but yourself. Look youself in the mirror in the morning and make the decision to do this for you. If you do this for someone else it will never become something you enjoy doing. It will become something you dred doing and will eventually quit. We both know you do not want that. When my frend Maggie first saw I lost the weight 2 years ago, she may have thought oh good for him, I hope he doesn't put the weight back on. Now she knows I won't, and that my friends is a great feeling. I did this for me and will continue to do it for me, just as you should do this for you. Well I have a serious case do DOMS today. If you do not know what DOMS is well it stands for, Delayed Onset Muscle Soreness. If you are just starting out this can be a frightening experience, if not frightening a bit of a surprise. What happens is when you work out hard you get tiny tears in the muscle. These tears need to heal and when they heal the muscle becomes a little larger and stronger. DOMS is a good thing and you will get to a point where you look forward to it. However sometimes as we get older and the muscles get use to the process you may not feel the soreness as intensely, don't worry this is OK and you are still building strength and power. Today I will be working shoulders, lateral and front raises, and I will do what I call walking the ladder with the dumbbell rack. I start with a low weight and hit each dumbbell in the rack for sets of 5 then I go back down to about 50 lbs and hit them for sets of 10 till I hit muscle failure. Friday I should be good an sore but ready for squats. If your are just starting out take it easy. Especially if you have not worked out before. Too many times someone new will attack working out with such fierce intensity that the DOMS they feel the next 2 or 3 days is not a motivator but more a reason not to do it again. Eventually you will look forward to DOMS and later when you don't get it you may wonder if you worked hard enough. I once read an article that basically stated if you hated working a certain muscle group you just might be doing it right or maybe you need to hit it harder, but that is a post for another day. Today will prove interesting. I will work chest today but the best laid plans can always get changed. Originally the thought was to train with some powerlifting friends of mine. Now these guys really know what they are doing. However, as I stated things sometimes change. My son is a cubscout and tonight is his moving up ceremony which means he becomes a Boy Scout. This is a big step and I am so excited for him. I am so proud of both my children. I will still work chest but it will be using dumbbells and the smith machine. When you bench in the Smith Machine it is not the same. Granted it is a lot safer, in that you can set the stops and the weight cannot come crashing down on your chest but the range of motion is dictated to being a straight up and down movement. In actuality a good bench is more like an elongated "C" motion. I hope everyone is working hard today and make sure you have a Happy workout. Flexibility, no I am not talking about stretching again. Weren't you paying attention. I mean in your schedule. To many times a person will say, "Oh I can't get to my work out today because this came up". I am saying don't give up. Just plan another time to do it and if it is a situation where you cannot get to the gym for the weights or you are not home for the weights then do an extra set of stairs for the day. Drop and pump out some pushups. Yeah someone in the office may look at you funny, just don't do it when they are around. Do some desk pushups. Just get the blood flowing my friends. You will be happy you did. Yesterday I worked on my deadlift form. I tried to send them to a friend of mine only to find out my email could not handle the file size. So I am trying to post it to Facebook so he can take a look at my form. I plan on working shoulders today or back. Not sure which yet. Probably my back. I am really trying to figure a proper workout schedule at this time. You see my dilemma is that I like to work on my benching with the guys at Albany Strength, which means I should not work shoulders on Tuesday, I probably shouldn't work back on Tuesdays either, However I know I need to get them both in at some point. I will figure it out and let you all know. Friday has become squat and leg day. That way I hit the big three exercises once a week. Eating, for any weight training it is very important to have the fuel in you body to get the optimal benefit from your workout. If you do a low carb regimen you need to chow down on some healthy fats. Like, an avocado or some nuts about an hour before your workout. If you workout in the morning be sure to have a good breakfast. You may not be able to eat an hour before in that case so shoot for at least 30 minutes. Then with in 30 minutes of completing your workout get some protein in your body. I prefer a protein shake because it is digested quickly and can hit the muscles for repair at a faster rate. Also at that time have some healthy carbohydrates. Based on your personal carbohydrate needs and what your body can handle and still lose body fat. Deadlifts will be my call of the day. Since the gym I frequent does not have an Olympic free bar I bring my own in. Form is very important for the deadlift and I really need to work on mine. Here is to hoping for a 400 pull soon. 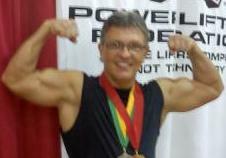 I will video he deadlifts today and if I am happy with my form I will post the video here. I hope everyone had a great holiday. I know I did. Have a great day and have a great workout. Difficult exercises are good for you, so resist the temptation to avoid them. Most exercises can be classified as either single-joint or multijoint movements. The former includes the barbell curl, in which only your elbow joints move. Along with the deadlift and the bench press, the latter includes the squat, during which your ankles, knees and hips are all being extended and flexed, while your upper body works hard to keep the load stable. Multijoint movements are the more difficult of the two types to master, but it's well worth the effort to learn their proper execution, since they result in maximum muscle growth of more complex muscle groups like the chest or the legs. For all those people who celebrate different religious holidays, have a wonderful day as well. I worked some benching last night and tonight I plan on doing some squats. I will warm up really well and then squat heavy. Working my way below parallel with 400 lbs. It will be very interesting to see what this new training program will be able to do for me. A lot of time we put mental blocks in our way, these mental blocks are harder to beat than the actual weight you are trying to push. Here is one of mine. I have pressed 315 in a bench training session. and that was after an hour workout. While I am confident I can press that amount I have yet to do it in a meet. I have pressed 305 in a USAPL meet. To get to the next level I truly believe that I need to break my mental block of pressing it in a meet. I plan on beating my block by making the 315 a consistent press. OK what is your mental block and how do you plan on beating it? Busy day a head of me today. chasing kids around for their sporting activities and hopefully getting my second day of chest exercises in today. I worked my legs pretty well yesterday and finished them with weighted leaps. OK sounds a little odd I know. I hold 50 lb dumbbells in my hands and jump over the bench turn around and jump back over for 3 sets of ten. I get into a very deep squat and explode up and over the bench. I am hoping this will help get me more explosive power out of the squat. Well if you are following my exercise program today is a day off for you. Have a great day! "Never let your age be an excuse for not pursing your dreams! Age had nothing to do with you staying healthy. You can look and feel like your twenty, you just have to work at it!" Good morning exercise enthusiast! I am going to work legs today and make sure I get a really good stretch and warm up. I plan on working on some flexibility today. I recently read an article where it stated that power lifters are surprisingly flexible. I totally understand this. We squat deep and when we bench we create an arch in our backs while keeping our butts on the bench. They take the dead lift. When you pull that weight up yes it is stretching the upper body. Heavy squats will be this weekend. Today being Good Friday, fish will be the protein choice. I enjoy fish. Tuna for lunch maybe a about 8 ounces of Talapia for dinner. A couple of protein shakes through out the day and around the work out and I should be able to hit 250 to 300 grams of protein today. Stretch stretch stretch, Again this is one of those areas I like to preach about but have trouble fitting into my schedule. I find when I put it here as a tip I feel I have to do it or I feel I let you all down. When you stretch the fascia membrane that surrounds the muscle after a workout and then flex after the stretch you are allowing more blood to rush into the muscle thus allowing the muscle more room to grow. So stretch it out everyone! Dead lifts went well yesterday. I was pleased with how I did. My left shoulder popped at one point and it felt great afterwards. My only guess is that a tendon or something in there was not lying correctly and when I pulled it popped where it should be. My workout partner heard it and said something. Feels great today so all is good. It is a funny thing. Sometimes I sit here and think to myself what am I going to put out here for tip. Then as I type it comes to me. My workout partner is going to be pushed to his limits today. I am going to work him hard. I will be hitting Albany Strength tonight and that means my normal lunch workout becomes me training Karl. Shoulders and back for him today. Had a huge steak and 3 eggs for breakfast and I am ready to hit the day. Sometimes when you first start working out you may feel some minor pain that is not muscle soreness. This could be the muscles tightening up and laying incorrectly on a tendon. I had this happen when I started working out again. Continue to push through with lighter weights and the tendon and muscles will fall back into place where they need to be. At least that is how it worked for me. The call of the day is the dead lift exercise. I need to really push this one today. My workout partner has no idea what he is in for today. This is a whole body exercise especially when you use good form and go heavier. You need to keep your back straight to avoid injury and be prepared for the bar to ride up your legs. I will go for a max today and let you all know how I do. Change things up occasionally confuse the muscle. The body is an amazing machine and it gets use to things fairly easy. So be sure to change the weight you use or reorganize the orders you do your exercises in. I will be working chest today and going heavy. First will be some warm up sets then the heavy stuff. Possibly finishing with 3 sets of 5 at 300. I will really need to have my head in the game and push through hard. After yesterday's 426 squat to the bench I realize with a little prodding from some friends I really need to record the squats so I can nail down my form and make sure I break parallel. (Thank you Laura and Brian) I also know I need to build a platform for my feet for my bench at home. No laughing I know I am short and don't need any more chiding from my friends. LOL I have been having my workout partner walk the ladder with the dumbbells. He needs to work on his stabilizing muscles to increase his bench. I call walking the ladder going up the dumbbell weight rack doing sets of 5 with each weight. Starting light and getting heavier. Then when we are done with the sets. We drop down to a point where he can get 5 sets of 10. It really fries him. The warm up is just as important as the full blown work out. Be sure to warm up the muscles with a lighter weight so you do not pull a muscle while working heavier. Even though the weight is light give the muscle a full flex to get the blood flowing. I am so psyched right now. I just squatted 426 to the bench. Not quite parallel. But I am getting there. Heavier is not always better. If your form is sloppy or not even close you are not targeting the muscles. Weights that are to heavy can force your form to be bad and the potential of getting hurt is increased. If you are feeling any Delayed Onset Muscle Soreness or DOMS do not work that body part. Let it heal and work another body part. Good morning, If you have had the chance to check my before and after photos you know I have not always looked this fit. This brings to mind a complaint I hear sometimes from people just starting. Sometimes as a new gym attendee it can feel intimidating. You may not have the physique you want and may be a little self conscious, and truly feel that people are watching you. Well they might be. The thing is you do not know what is going through their head. They may be thinking, hey good for them, or you may get the muscle head who thinks this is my gym. Well that thought is pure BS. The muscle head did not get where they are by not being in the gym. These guys are few and far between. Most are happy to see anyone working hard to get healthy. So when you feel that someone is watching this is most likely a good thing. Take advantage of this and work harder. If you have a question about an exercise or a piece of equipment ask. Someone will be willing to help. We all can get there. 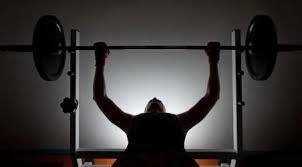 If your workout time has to be in the morning but every morning you feel I really don't want to get out of bed, Try going to bed in your "CLEAN" workout clothes. Hey they are comfy any way. That way when the alarm goes off you are all ready dressed and ready to go. Some dead lifts this morning, again this is for form. I will start going heavy for the June 4th meet in 1 week. Something I learned about myself though. My legs take a long time to warm up. I was squatting 225 for reps and it felt heavy and awkward. I just did not feel strong doing them. At the end of the sets I put 335 on the bar and did 3/4 squats. It felt great. Did a set of 10 and I felt strong. Lesson learned. When I do a full power meet make sure I have plenty of time to warm up! Setting goals are important. Remember though if you set a high goal set little goals to get you there. Well I started the first step towards squatting 400. Being only 166 lbs let me tell you to put 435 pounds on your shoulders and walk out of the rack is a new experience. My thought is to get use to a much heavier weight and when I work my way up to squatting that much it wont feel as heavy. It was so heavy. I didn't try to squat it. I am really just trying to get use to the weight. For the record I have to make sure I wear my lifting belt next time. 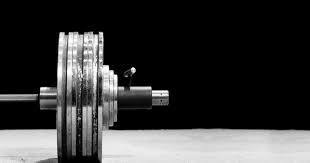 When doing a new exercise use a lighter weight and concentrate on your form. Make sure you have it right before you go heavier. I am going to try this new schedule for my workouts. In addition to heavy squats on Sunday mornings. (I mean heavy for me 400 lb squat in my future I hope) Along with the schedule below please do cardio 3 days a week for 20 minutes and crunches nightly. Get Sweating!!! Pull ups or let downs 4 sets of 5 Pull ups if you can do them lets downs till you can. Lets give this a shot for a while.